Ideal for Bass Mackerel Pollock Wrasse Mullet seatrout Kayak Spinning Plugging Floating Ledgering Carp Pike Perch Trout Salmon Barbel. 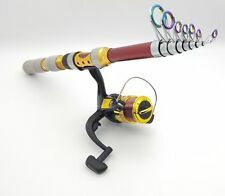 "The most unique Fishing Rod & Reel Combo ever Designed". The most unique Fishing Rod & Reel Combo ever Designed see the video below. 1roll 100M 1.5# Green PE brained Line. 1pcs PE line Plier. Fishing Lure. Soft Fishing Lure. Hard Fishing Lure. Fly fishing lure. Fishing Rod & Reel Combo. Octopus Skirt Lure. 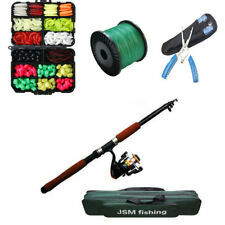 The fishing rod is suitable for fishing lovers and new anglers portable to carry outside. 1 Fishing Rod 1 REEL. Spinning fishing rods for traveling. Aluminium spool. High density carbon fiber material makes the fishing rod hard and durable.